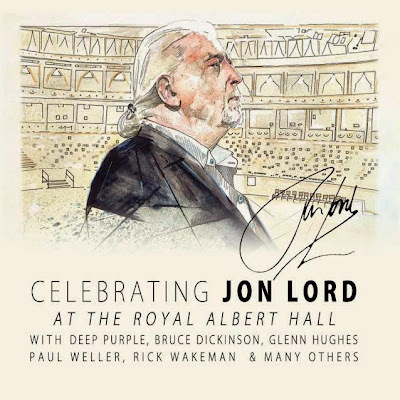 A new video preview of "Celebrating Jon Lord - At The Royal Albert Hall", the forthcoming DVD, Blu-ray and CD due this fall, is now available. Due September 26, the event was a tribute concert to honor the late Deep Purple keyboardist’s life and work. A new trailer reveals the first images from the show, including excerpts from “Burn” (with Glenn Hughes, Bruce Dickison, Ian Paice, Don Airey and Rick Wakeman), The Artwood’s “Things Get Better” performed by Paul Weller, “This Time Around” performed by Glenn Hughes, and snippets of the grand Deep Purple finale including the songs “Uncommon Man”, “Perfect Strangers” and “Hush” featuring Bruce Dickinson, Rick Wakeman, Phil Campbell, Bernie Marsden and Micky Moody. Lord passed away July 16, 2012 at the age of 71 after a long battle with pancreatic cancer. With Purple, Lord co-wrote many of the group’s legendary songs, including “Smoke On The Water”, and played with many bands and musicians throughout his career. Lord is best known for his orchestral work, “Concerto for Group & Orchestra,” first performed at Royal Albert Hall with Deep Purple and the Royal Philharmonic Orchestra in 1969 and conducted by Malcolm Arnold, a feat repeated in 1999 when it was again performed at the Royal Albert Hall by the London Symphony Orchestra and Deep Purple. Jon’s solo work was universally acclaimed when he eventually retired from Deep Purple in 2002.